I hope that you had a wonderful holiday and got/gave some really great stuff! My husband prides himself on giving really great gifts. He takes great thought and care and it's one of the many things I appreciate about him. When it comes to gifts, he never just "dials it in." So, come Christmas morning, my husband handed me my gift, beaming. And I tore into two packages. The second gift. Oh my. 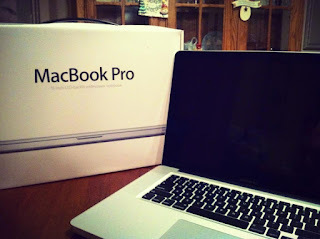 I opened the heavy box to reveal a top of the line, brand-new MacBook Pro 15 inch computer. Um I couldn't hide it. My reaction wasn't one of joy. It was one of, "Why did you buy this? It's way too expensive. We need to take it back." My husband was visibly upset - this wasn't the reaction he'd hoped for. Now, I need a new laptop. My livelihood lies in having a computer, I am co-owner in a television/film company, I blog, I travel, I will be editing a movie on it and stringing out a television pilot (we just sold a show to DIY network!! )… I was working on a 7 year-old Mac laptop that couldn't even hold a charge anymore. It doesn't have the capability to edit and it's been hanging on by a thread, on the edge of death, for the last six months. So, hubby really thought this through. It was a gift I needed and should've appreciated. My argument was, I could get a cheaper one, a second-hand one. My company is finally beginning to generate a little cash flow and my partner and I discussed finding one for me (perhaps second hand but in excellent condition) and having it be my "business" computer. Who was I to have this $2000 gift!? Ridiculous. I truly did appreciate the generous thought. I hugged hubby tightly and said, "Sweetie, I'm sorry I can't keep this - but it was very, very thoughtful and I love that you wanted to do something so grand for me. But really, something less expensive will do." My husband sighed disappointedly. And said: "I know you could've gotten a cheaper one through your company. I know that I could've bought you a less expensive version. I got this for you because you deserve it. You work hard, you will need something of quality to edit on. I saved for months for this for you because I KNEW you would never, ever buy something like this for yourself. You are doing big things, and I believe in you. You are worth a very expensive computer." And then it hit me. My initial reaction was deep-down based on the fact that I didn't feel worthy of such an expensive thing. And that was the kind of thinking that led me to being overweight my whole life. Successful people do not question their worthiness of such things. In fact they expect them. Now (even though I'm not a fan of his) would a Donald Trump (or any other top business guy) ever say, "I don't deserve the best." Nope. Cheap food, bottom of the barrel gym membership, second rate sneakers, whatever and everything - needn't be great because OK or good (or even in the case of my food) bad - was good enough. Once I started caring about myself, I decided that I was "worth" shopping at Whole Foods for once in a while and I was worth investing the money in a good pair of sneakers and even springing for a boot camp class or yoga groupon once in a while. Since beginning this blog, so many people who are struggling with weight have reached out to me. And I keep seeing one common thread. Most are struggling to love themselves. Now many wouldn't admit it out loud but I can read it in their words, hear it in their voice. They feel like they've let their family, the world, themselves down. They feel embarrassed, ashamed, helpless, useless, weak, powerless and less than… not deserving. I believe this is the real root problem for many of us. All emotions I once felt at 255. And my biggest advice to most of these people who reach out to me is to seriously work on stopping the self-loathing, work on getting rid of all those negative emotions and to start loving and honoring yourself. In order to make the good decisions and carve the time, money, effort and energy it takes to make change, you have to believe in your heart that you are worth working, fighting and living for. And I often had to fake it 'til I could make it. It took years and I still struggle with feeling worthy of stuff - whether it's a small expense, taking time for myself or a big expense. I often will still think, "I would love that coconut water but whoooa $1.79 for that little thing!? Who am I? I can drink tap water…" "I can't run another marathon, that requires so much time! Who am I to be so selfish with hours on a Saturday to run?" "A $2000 computer? I don't deserve that. No way." That computer represented the small part of me that still sometimes feels unworthy of great things. Great things that possibly include good health and success. Marty was right, I'm worth it. Question to you: Can you relate? Do you ever feel guilty or unworthy of time away or a good pair of sneakers or anything else? PS: Worthy of something doesn't mean putting yourself in debt! If we couldn't really afford this - it would've gone back. While money is still tight - Hubby saved and planned for this expense and it's a true investment into my business. ALL THE TIME! I can't get anything without it being on sale or with a coupon. I need to justify everything to myself. I got $2 t-shirts for our trip because I knew the entire thing was ALREADY costing an arm and a leg. I've been having an easier time with carving out the workout schedule, only because I haven't been working and my kids are older, so they don't seem to miss me. The Ragnar is my celebration of how far I've come. I'll still be buying sneakers at discount. The frugalness is just too ingrained in me now! Well, being really frugal also plays a role. I'm super frugal and a coupon clipper. I also went thru a period where we really struggling. I'd lost a six-figure job that I had for years, the company that hubby worked for folded and he was out and our world was turned upside down. We eventually had to short-sell our home and I really pared down on everything!! But, there's a difference between having to skimp and bare-bones things because of necessity and skimping and bare-boning it because you don't feel like you deserve things. I am still not frivolous with things. But I still hem and haw (and often skimp on myself) where I shouldn't... if spending an extra $10 a week on slightly fancier produce is going to keep me healthy, why do I beat myself up over it? Often putting back the "fancy" pomegranate or why do I continue to wear socks that have holes in them, rather than spring a couple of bucks for new ones? Hmmm… maybe I need to go back to therapy. :) I guess the key is being at least self-aware, and this experience has helped me to become more in touch with this. It's those amazing A-Ha moments in our lives isn't it. You have a keeper in your husband there. He was absolutely right :)Sometimes it takes looking at ourselves through other peoples eyes to see the worth in ourselves that we don't see. And the fact that he saved for months is amazing too :) You are worth a brand mew computer. Much more in his eyes. I struggle with this because I know people who go into debt because they believe they're "worth" the luxury car or the designer shoes or the overpriced electronics. Well...yeah...you may be worth it, but can you afford it? Those are two different things. Paying a little more for quality items (like food or running shoes) is also much different than buying crap you don't really need. My grandparents grew up in the depression and passed on their fugrality to their children. It took me years to get my mom to go on a trip to Europe. I had to convince her that she could afford it, and that the experience would be worth the cost. She loved it and still talks about it. It sounds like your husband really gave it some thought and planned it for a long time. He socked away the money, perhaps giving up little things for himself for months...that's love! Thank you for sharing this story! Yes. I feel that way too. And I have added "worthy" to my list of how I want to feel next year. I think that is psychologically tied to so many things that feeling I am worth the investment is key to succeeding in all my life goals. Thank you for posting this. I'm glad you see you are worthy of such investment and I'm glad you shared it. It made me see I say the same thing to myself and it's something I would not have seen without your post. Great post! I'm glad you decided to keep the computer! I can definitely relate! I always bought discount shoes and once I started running I went to a real running store and got fitted with the most comfortable shoes ever! What a difference it made! Recently I decided that I was worth spending $10-12 a week on the giant container of fancy lettuce and the yummy grape tomatoes because I really enjoyed them. What a fantastic husband you have. Love how he handled this and love that it sunk in to you that you ARE worth it. Great story! Wow! Reading this brought tears to my eyes. I really needed that! I always feel guilty for the time I take to workout or walk or run. This is something I will spend working on in 2013. Feeling worthy. I can't even count how many times I've put back the healthy vegetables and foods because my kids wanted something or I felt guilty for spending the extra $5-$10 on myself. Thank you! Thank you for sharing all that you do. Should the ING NYC marathon be cancelled because of Sandy? Follow Jennifer's board From Fat To Finish Line blog posts on Pinterest.